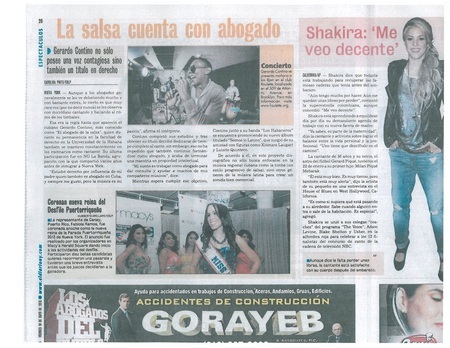 Feature in Diario de las Americas: Sencillo de Gerardo Contino y Los Habaneros honra a varios países: La agrupación neoyorquina presenta "Siempre Latino", himno a la diversidad. Album Review of "Somos Latinos" by Hector Aviles. Click here. Album Review of "Somos Latinos" by George Velez, Jr. Click here. New York Times write up on BAM Cuban concert: Click here. Radio interview with Vicki Sola on Que Viva La Musica, 89.1FM. Click here for podcast. Interview on NY1 Television in Spanish: Click here. Interview with El Diario in NYC. To read full article online, please click here. Write-up in Impacto NYC. To read full article, please click here. Mention in Special Edition of French magazine, L'Express about "must see" shows in NYC. Click here to read article.